Determine whether your child is right-eye or or left-eye dominant. Have your child stand facing toward a wall that has some kind of feature on it--a clock, a picture, etc. Tell your child to point to the clock, picture, etc., then close his right eye. If his finger stays in the same place, he is left-eye dominant and you should choose a left-handed bow. If his finger appears to "jump" so it is now pointing somewhere to the right of the object, he is right-eye dominant, and will need a right-handed bow. Measure your child's entire arm span to help you determine what draw length bow you should purchase. Draw length is the measure of how far the bow can be drawn back. Have her spread her arms out with her palms facing forwards. Run a tape measure from the tip of one middle finger to the other. Once you have this measurement, divide it by 2.5. This should give you the correct draw length for the bow you'll be purchasing. Select a bow of the proper length for your child. Unlike draw length, this measurement refers to the bow itself, how many inches it measures from top to bottom. Youth bows tend to measure between 31 and 41 inches in length, but you should have your child try out several bows at different lengths to see which one is most comfortable. Estimate the draw weight your child will need in a bow. This refers to the pounds of pressure that will need to be exerted to draw a bow back to its fullest extension. A child weighing between 50 and 70 pounds will usually be able to pull a draw weight of 10 to 15 pounds. For a child weighing 70 to 100 pounds, a draw weight between 15 and 25 pounds would be appropriate, and a draw weight of 25 to 35 or 40 pounds should work for a child weighing between 100 and 130 pounds. Children between 130 and 150 pounds ought to be able to handle draw weights between 40 and 50 pounds. Take into account budgetary considerations. If your child is new to the sport of archery and this is something you're just trying out to see if he likes it, select one of the lower-priced models. You can usually find some type of beginner bow in the $40 to $50 range. 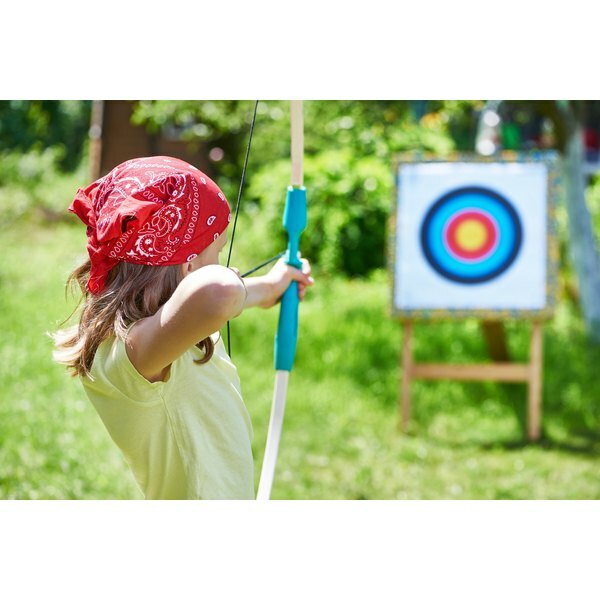 If your child really enjoys archery, however, and wants to get into competition or bow hunting, you may wish to select a model specially made for his needs and interests costing anywhere from $100 to $400 or even more. Be sure to take into account that your child is still growing, though. You may not want to mortgage the house to purchase archery equipment that he is likely to outgrow in a year or so.